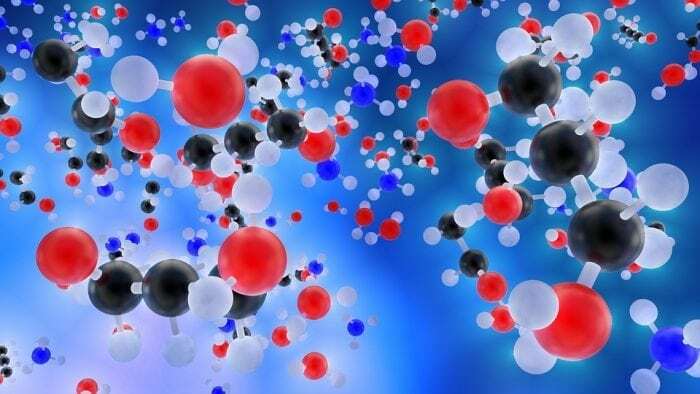 The separation and recovery of biological molecules from biomass or fermentation media with minimum environmental effect is a tedious task, and developing such efficient and cost-effective downstream processes remains a main challenge. Traditional liquid-liquid extractions are effective in various stages of downstream processes; however, they raise environmental concerns due to the use of volatile organic solvents that may denature the targeted molecules. Moreover, existing techniques have several limitations in terms of selectivity, efficiency, cost, and complexity of processes. Aqueous biphasic systems (ABS) are biocompatible variants of liquid-liquid extraction systems and are considered cleaner and eco-friendly alternatives since they are based on the most sustainable solvent, i.e. water. In addition, the presence of water in maximum proportions offers compatibility to bioactive compounds. Conventional ABS consists of polymer-polymer or polymer-salt combinations as phase forming components. However, the disadvantages associated with these systems, like slow separation rates, prompted the research community to explore the neoteric phase forming components such as ionic liquids (ILs). ILs are a unique class of molten salts, typically a hybrid of large unsymmetrical organic cations and organic or inorganic anions. ILs are usually defined as liquids below 100 °C, and most of them are liquids at room temperature. ILs stirred the interest of the scientific community with their outstanding properties like negligible volatility, excellent thermal and electrochemical stability, etc. The most distinct and useful properties of ILs for ABS include potential solubility for a wide range of compounds and the possibility to design the structure by wide combinations of cations and anions. By selecting appropriate ions to form ILs from a wide range of combinations available, efficient separation and extraction techniques could be developed. In our research laboratory at Indian Institute of Technology Madras (IITM), we are interested to develop extraction system based on tetrabutylammonium based ILs and the proposed systems include ILs, tripotassium phosphate (K3PO4) and water as phase-forming components. A series of ILs based on tetrabutylammonium cation and carboxylate anions of variable chain length have been synthesized, purified, and characterized. The selected classes of ILs were observed to form biphasic systems at comparatively lower concentrations of the inorganic salt, and K3PO4 is one of the best known salting-out agents. The synthesized ILs in combination with K3PO4 formed two aqueous phases at defined concentrations and temperature. The phase diagrams were constructed at temperature 25 °C and atmospheric pressure. The phase diagrams give an idea about the concentrations at which the system exists either as a completely miscible single phase or splits into two phases. Both the separated top and bottom phases are composed of water, and each phase is rich in either of the other two phase forming components, i.e. IL and salt. Understanding the phase diagrams is essential to select appropriate concentrations for extraction of the targeted biomolecule. ILs consisting of longer alkyl chain anions provided a favorable condition for the formation of the biphasic system. Our target was oriented towards the extraction capability of proposed biphasic entity for extraction of an amino acid namely Tryptophan. Tryptophan is an essential amino acid and present in most protein-based foods. It was considered as a model compound for the class of amino acids. The analysis of the obtained experimental results indicated that the proposed IL-based ABS can be successfully used for the extraction of Tryptophan. 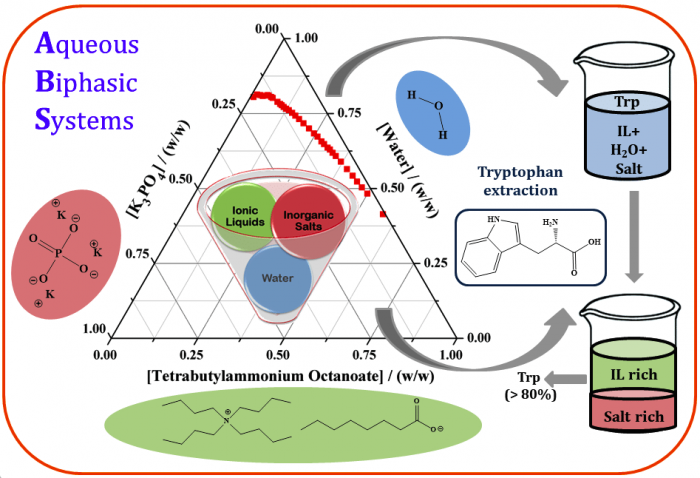 The initial experiments carried out at the laboratory scale were done with commercially available Tryptophan and results were analyzed with an intention to estimate their applicability for real biomass matrix. The analysis of structural variation of ILs suggested that the presence of longer alkyl anion chain length positively favored the extraction efficiencies of systems. The structure of cationic part of IL was also modified to introduce an aromatic benzyl group and corresponding extraction efficiencies boosted up considerably. In this study, ILs with benzyl substituted trialkylammonium cations and halide anion were considered in combination with potassium based salts. The present work is preliminary research with an intention to develop efficient, integrated platforms for separation and extraction of bioactive compounds from biomass matrices. The studied IL-based ABS can be extended to a wide range of complex bioactive compounds including amino acids, alkaloids, proteins, enzymes, etc. Further, these IL-based ABS techniques could be used in addition to other IL-based separation processes, like solid-liquid extraction, aqueous three-phase partitioning, etc., to formulate integrated separation and extraction techniques. These findings are described in the article entitled Evaluation of anion chain length impact on aqueous two phase systems formed by carboxylate anion functionalized ionic liquids, recently published in the Journal of Chemical Thermodynamics. This work was conducted by Anusha Basaiahgari and Ramesh L. Gardas from the Indian Institute of Technology Madras, Chennai. Anusha is a research scientist at the Indian Institute of Technology Madras Department of Chemistry. Dr. R.L. Gardas is an Associate Professor in the Department of Chemistry at the Indian Institute of Technology Madras.